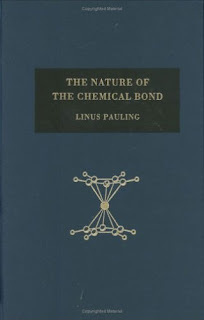 No other chemistry book in the twentieth century influenced the general thinking of chemists more than Linus Pauling's "The Nature of the Chemical Bond". Yet take an opinion poll among undergraduates or graduate students and hardly anyone would have read a single page from this classic. This unfortunate facts only reflects a broader problem with undergraduate education; the relentless urge to teach problem solving at the expense of an appreciation of the essential philosophy of the subject. And very few chemistry books ever published communicate the deep structure of chemical thinking as well as Pauling's memorable volume. In the latest issue of Nature, Philip Ball visits this lost gem. The book is remarkably and fortunately still in print but it's not really making an impact. My own introduction to "The Nature" was fortuitous. I had of course known about Pauling and his legendary status but never had the chance to actually peruse the volume. Sometime during my senior high school year a friend showed me the book which he had borrowed from his uncle and I was hooked. At first put off because of the extraordinary volume of detail in it, I soon realized that the elegant explanation of this voluminous material through a few simple principles was the crowning achievement of Pauling's thinking. It was all (or at least most) of chemistry through a few good concepts of chemical bonding. Although I did not read every single thing in the book, I read most key parts multiple times and still keep referring to it constantly. "The significance of The Nature of The Chemical Bond was not so much that it pioneered the quantum-mechanical view of bonding, but that it made this a chemical theory: a description that chemists could understand and use, rather than a mathematical account of wave functions. It recognized that, if a model of physical phenomena is to be useful, it needs to accommodate itself to the intuitions and heuristics that enable scientists to talk coherently about the problem. Emerging from the forefront of physics, this was nevertheless a chemists' book." Physicists' dream is to find five equations that describe the entire universe. Pauling came the closest to doing this for chemistry; no wonder that a poll by Time magazine about the greatest scientists of all time included Pauling as only one among two twentieth century scientists, along with Einstein. His concepts underlie every branch of the science and crucially extend into interdisciplinary branches like biology; it was his insights into chemical bonding that made him one of the founding fathers of molecular biology by way of important ideas on the structures of proteins, enzymes and antibodies. "The Nature" contains scores of examples drawn from physical, organic, inorganic and biological chemistry. The sheer sweep of Pauling's contribution to bonding is astonishing. It would not be an exaggeration to say that his book did for chemistry something like what Darwin's "The Origin" did for biology; it brought all of chemistry under a unifying rubric. And like "The Origin", "The Nature" is one of the very few founding texts of science whose language is simple enough to be understood by beginning students (of course Darwin did one better since his book can be understood easily even by laymen). Every student of chemistry must be exposed to this foundation of chemistry, yet "The Nature" has been forgotten in colleges and graduate schools. Of course it cannot replace a modern chemistry course, of course the language is somewhat dated, of course chemistry has made exciting advances since Pauling that are not included in the book and of course the valence bond theory described by Pauling has been replaced by molecular orbitals in many important cases. But the book should be required reading for understanding the core philosophy of the subject and how a few simple concepts can explain the astounding variety of the material world around us. It's also a superb vehicle for demonstrating the limitations of the reductionism of physics and the empirical character of chemistry. The goal of a chemistry education is not simply to solve chemical problems, but it is to view the world through a chemical lens. And that means to view the world through the language that we inherited from Pauling. If you want to think like a chemist, you cannot do better than "The Nature of the Chemical Bond". Buy it, it's actually not that expensive compared to most college and graduate school textbooks. I'm always looking for good book recommendations. Hopefully this new read will guide my own teaching of fundamental chemical principles. Thanks!